SismoDermie® 3D (oscillation 3D Premium), a combination of the lateral oscillation and the sagittal oscillation for incomparable results. Sismo First® is the latest generation of oscillating platform designed for increased efficiency. It combines all the benefit of the lateral oscillation with a major innovation : the tilt forward and rearward of the plate. The new SISMO FREE MOVE® system brings a new dimension to the oscillation. In addition to the lateral movement, the wider tray tilts of 1 to 15 ° forward and backward. Thus positioned, the body tends to rebalance seeking reflexively deep muscles of the body. Leaning forward, the work of the posterior muscle chain of the body increases, while a backward tilt solicits chain anterior muscle. With SISMO FREE MOVE®, tilt can be stable (tilt locked) or variable (free banking), under the pressure imposed by the feet to muscular work even faster. The body is intensely and durably remodeled. Patented systems, Air Track® and Hydro Track® then regulate the pressure exerted by the foot to keep a naturally fluid oscillation in any position of inclination of the tray. The more intense muscular work is accompanied by a significant mobilization of fat reserves and therefore fat storage. The friction movements are performed more fully promote the rapid elimination of cellulite. Drainage is supported for efficient elimination of toxins. The body quickly find long thin shapes. Comfortable, attractive and noble, the SISMO FIRST is an ally of aesthetic excellence centers. Few minutes on the SISMO FIRST before and after slimming beauty treatment stimulates circulation and optimize the effects of treatment, the body is more receptive to active rejuvenating treatments, toners or just relaxing. 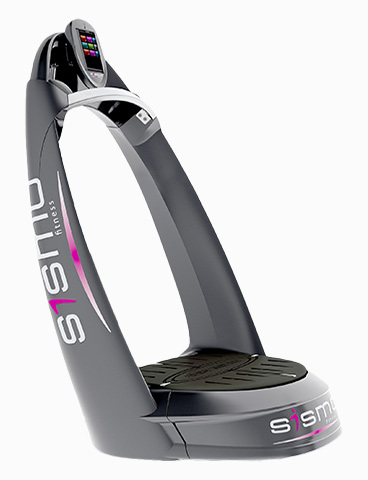 A short time of muscle relaxation on SISMO FIRST also contributes to the full body relaxation. In gyms, SISMO FIRST becomes new partner of sports. It fits perfectly in training protocols or physical preparation. Thus, the free oscillation angle combined with mime movements adopted in certain activities such as surfing or skiing for the athlete to prepare the joints and muscles, at their own pace before the sport field. Performance considerably strengthened the FIRST SISMO also offer major sporting intensive exercises of high quality. The extra-large color touch screen was developed to allow easy handling and quick handling multiple capabilities SISMO FIRST. The 50 pre-programmed protocols and 12 customized programs are designed to enforce an immediate use of the appliance. Real personal trainer, SISMO FIRST provides an opportunity for everyone to work an area of the body, midsection, thighs and buttocks, legs, chest and arms with a clean as toning goal, remodeling, sheathing, relaxation... according to its level from beginner to advanced athlete. The manual setting also provides the ability to create original exercises. To facilitate the management of occupational use, access to SISMO FIRST is protected by a password. Behind its elegant lines, the SISMO FIRST hides technological treasures. The whole structure has been reinforced to withstand up to 500 kg load. Its Auto Rotor System® ensures normal operation of the machine even if the imbalance of weight distribution on the board, thus providing the opportunity to perform exercises resting on one foot. The new direct drive V guarantees high power and energy saving. Air Track® and Hydro Track® systems ensure regulation of the pressures and flow oscillations irrespective speed. 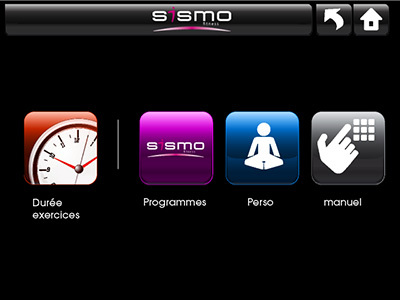 Substile alliance of smooth curves and high technologies, SISMO FIRST is futuristic. 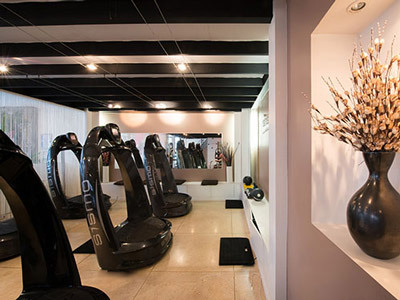 His reassuring and elegant design suits for refined interiors Spas and beauty centers as well as sober and technological designs modern fitness facilities.